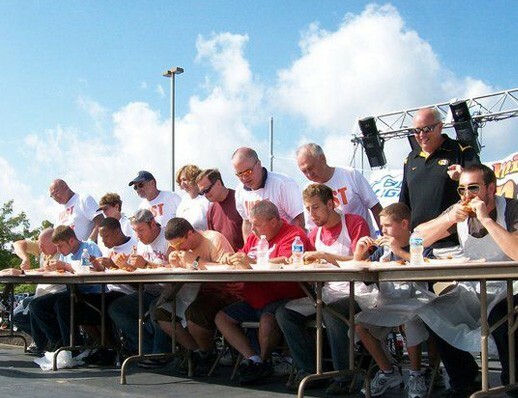 A scene from a wing-eating contest at last year's Midwest Wingfest. This holiday weekend, the second annual Midwest Wingfest takes place in Fairview Heights, Illinois, on Saturday, September 3, from 11 a.m. to 11 p.m, providing a way to honor U.S. veterans while dining supreme. The event features up to 25 vendors competing for top honors in both hot-wing and gourmet categories. Co-chairpersons Doug Shoemaker and Jere Wilmering, along with a committee of around ten people, volunteer their efforts year-round for the one-day culmination of family fun. Midwest Wingfest earned nonprofit status this year with the intention to donate proceeds to the Fairview Heights Chamber of Commerce and the USO. "Everybody has just an absolute ton of fun while helping to raise money for an awesome cause," says Shoemaker, a former military member with a huge place in his heart for the men and women who have served the country. Last year's event had approximately 17,000 attendees who consumed a total of about 96,000 wings. A central cook station equipped with a 48-foot refrigerated truck will hold 12,000 to 13,000 pounds of chicken wings for this year's event. A scene from last year's Midwest Wingfest. "We have a fry station set up so that anyone, whether they are a local restaurant or a local fire department, could participate with minimal setup costs. They just bring their sauce, and I send a golf cart out with chicken to their booth to make it as easy as possible for everyone," says Shoemaker. Vendors include local wing warriors like Kathy's Wings-n-Things from Red Bud, Bully's Smokehouse from Edwardsville and Cajun Charlie's from Evanston as well as some well-known regional restaurants like Hooters and Buffalo Wild Wings. "Wingfest is a dedicated wing festival, but it's also blossoming into an all-out food festival," says Shoemaker. "Each vendor operates independently and is competing with their wings while trying to outdo each other with other food items as well -- everything from pork nachos to chili dogs." 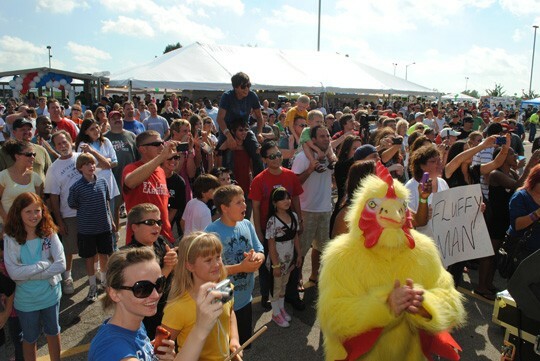 Entertainment for the event exists in the form of a "5K Chicken Run," a talent show, live music, wing-eating contests and, of course, an obligatory chicken-dance performance. Midwest Wingfest is held in the east parking lot of Dillard's at St. Claire Square, and admission is free.